For Grizzly Bear’s Chris Taylor, cooking has always been a way to make friends, extend hospitality, and conjure the comforts of home while touring. A few years ago at Coachella, Taylor recalls throwing together an impromptu backstage barbecue outside of Grizzly Bear’s tour bus for some of the other bands. 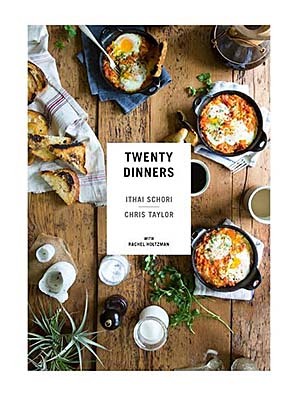 When Taylor became friends with Ithai Schori, and the two discovered their mutual love for throwing dinner parties, they decided to write a cookbook together, Twenty Dinners. They wanted to spread the word that cooking isn’t all about following recipes to a T—it’s also about improvising and inventing and having a good time. Chris Taylor of Grizzly Bear’s favorite burger from Twenty Dinners. In a bowl, combine the beef, onion, garlic, and jalapeño with the bourbon and Worcestershire sauce. (Depending on how much spice you want, you can use more or less jalapeño. Also, leaving in the seeds will add even more heat. You can always add more later when you adjust the seasoning.) Let this mixture marinate while you prep other items for your meal—it only gets better as it sits. So this is a great time to get your grill nice and smoking hot and clean. Recipe reprinted from Twenty Dinners by Ithai Schori and Chris Taylor. Copyright © 2015. Photographs copyright © 2015 by Nicole Franzen. Published by Clarkson Potter/Publishers, an imprint of Penguin Random House LLC.